Even with very limited human and financial resources it is possible to take initial steps to understand your exposure to climate change risks, and undertake a preliminary adaptation plan. Failure to act to reduce the risks of climate change carries risks of financial loss, litigation, damage to the natural environment, withdrawal of insurance cover and failure to realise opportunities. Decision making for coastal adaptation is often bound up in uncertainties that make it hard to get organisational buy in for action. There are approaches and tools that can help you get things done. 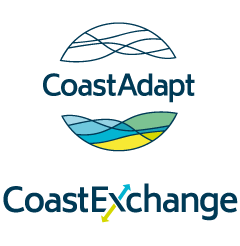 CoastExchange is an on-line forum for climate change adaptation professionals, providing opportunities to share experiences and build networks. Successful community adaptation to climate change requires strong and positive engagement across the wider community that supports learning, builds trust and relationships and facilitates individuals and groups to contribute their views, values and concerns.